My favorite kind of summer lips are bright and hydrated. I am always looking for products that moisturize my lips and keep them hydrated for as long as possible. No one wants chapped lips on a hot summer day, right? So, I was basically looking for a glossy stain when I found this guy. I was thinking about trying the new Dior lips stain or the NARS Powermatte but I couldn't find it anywhere and Eid was coming up so I needed a long lasting lip stain. The entire day, on Eid, is spent talking and eating and there is no time for touch ups and YSL Vinyl Cream Lip Stain did not disappoint. I am so happy that this product stayed on my lips the whole day. It did loose some of its 'vinyl shine' and some pigment but overall it looked great. 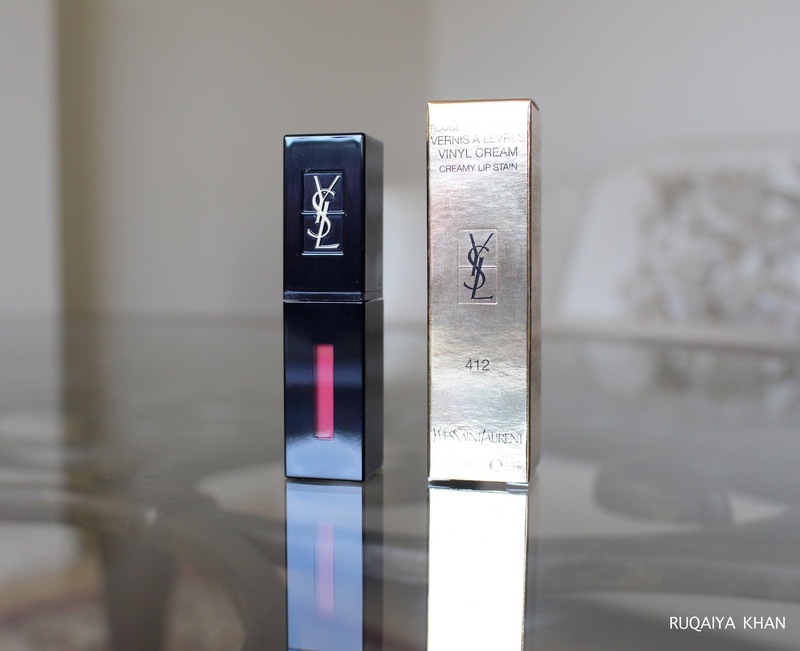 The Vinyl Cream Lip Stain is the first creamy lip stain from YSL. It seems like an improved version of the YSL Glossy Stain with a much better texture and longer lasting formula. It promises 10 hours of wear time but I would say, it was much more for me. The vinyl shine lasts 5 hours on me before fading. Its still shiny for the rest of the day but not super shiny. The stain lasts forever on me! Even at late night when I remove my makeup, there is sufficient amount of pigment that comes off my lips. I'm so impressed - this is the only lip product I m using these days! It can be layered on for more color and shine but even a single coat is beautiful. The applicator has little grooves on it, that holds product as I apply. It does not drip off and the application is very controlled. However, I found the applicator (i.e. the sponge part, not the handle) a little too big for my lips. And I have big lips! Haha! I felt it's a little too bent, a little too long and a little too pointy. I had to get used to it, especially outlining the lips was a tad bit of a challenge but now I am okay with it. The packaging is so sleek and practical. It is a glossy black, plastic case with color window in the front and the back. It doesn't weigh much and can easily be carried in the makeup bag. At the price point of $42, I expected more luxurious packaging. At least they could have done the YSL logo in metal instead of the same plastic with dull gold color. Its a little disappointing at first but it still looks nice on vanity and the product inside is gorgeous!! I have at least 3 layers on for these swatches and you can still see my pigmented lips. Its truly a lip stain and not a liquid lipstick but the color is gorgeous!! I almost want this lip stain to become a lipsick! The shade 412 Rose Mix is a warm pinkish rose shade with a hint of coral. It is the perfect bright pink for my medium complexion. Its not neon and not too attention grabbing. Its a very elegant color for lips. Its appropriate for evening soirees and I see myself wearing it more and more during the longer summer days. I would highly recommend this shade alone because it looks amazing on warm complexion. The texture of YSL Vinyl Cream Lip Stain is like a creamy liquid lipstick and for some reason I expected the Vinyl Cream Lip Stain to be full coverage, may be because its advertised as highly pigmented. And definitely, it is the most creamy, the most pigmented and the most lasting lip stain formula, I have ever used. Its extremely light weight to wear, super moisturizing and it never dries my lips. The lip stain last the whole day, until I remove it with a makeup remover. I love the creamy light weight, almost whipped up, texture. It's a very good quality product. I only wish it was lightly scented, because layering it on makes the scent more intense and even though I love scented products, this sometimes really gets to me and then I have to distract myself because it looks amazing!! I wore 2 coats of this on Eid at home and for dinner I layered on a lipstick for a full coverage look. Even when my lipstick wore off, the stain was still there, so I was never with patchy lips or faded lipstick look. Another cool thing is that it doesn't transfer much after its completely set (i.e. 30 minutes or so), so I did not see it on the rims of the glass nor on anyone's cheeks :D:D This product is great. The best thing is that all the shades of the YSL Vinyl Cream Lip Stain are so wearable that I see myself grabbing some more over time. It's only 5.5 ml for $42 so I think I will finish this off faster than any other lip product. Also, because layering it on gives a gorgeous vinyl shine look which I adore!